This post is a part of #RedVelvetLove campaign hosted by #CollectiveBias, the social shopper media company. All opinions are mine alone. 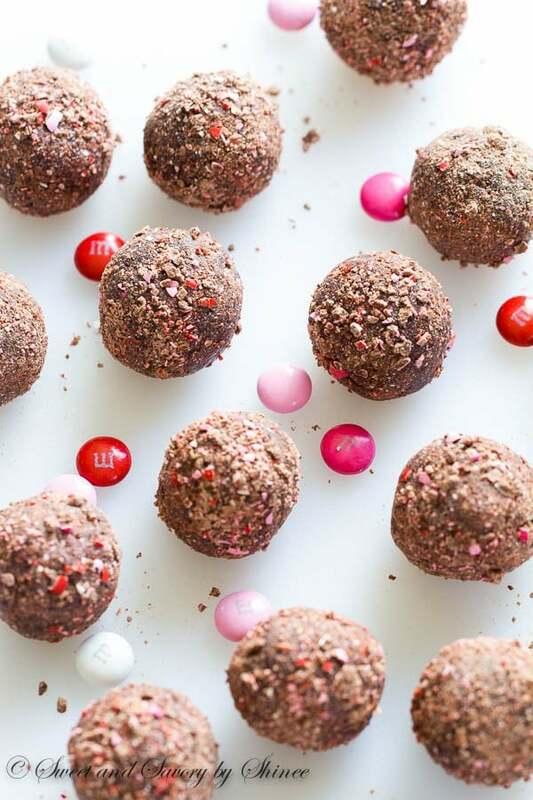 Surprise your friends and family with these silky smooth and super easy chocolate truffles rolled in crushed M&M’s® on Valentine’s Day. I genuinely believe that Valentine’s Day is not just for couples. Whether you’re single or not, celebrate LOVE with your loved ones, your dear friends and family. There is really no reason to be depressed that you haven’t found your other half. Celebrate friendship! Before I met my husband, my girlfriends celebrated this day cherishing our love and friendship. Look at this cute card from my friend, Olya. 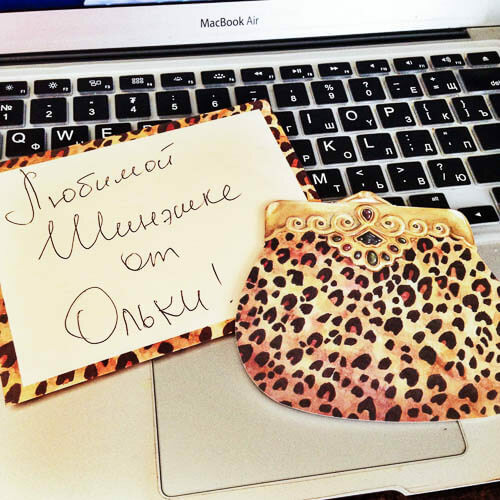 (It says, “To my dear Shinee from Olya”.) It’s from 2007! Now, it’s not all red and loaded with hearts, but it’s very special to me and I keep it on my desk, as a reminder that love between friends is real! How about this year we will celebrate friendship with lots of chocolate? Better yet, with a box of homemade chocolate truffles? Such as this! Smooth, slightly fudgy and oh so good! A little bit of Kahlua enhances the bold chocolate flavor. And fun part is that these truffles are rolled not in usual cocoa powder, but crushed M&M’s® Red Velvet. Oh yeah, crunchy colorful burst of color and texture! 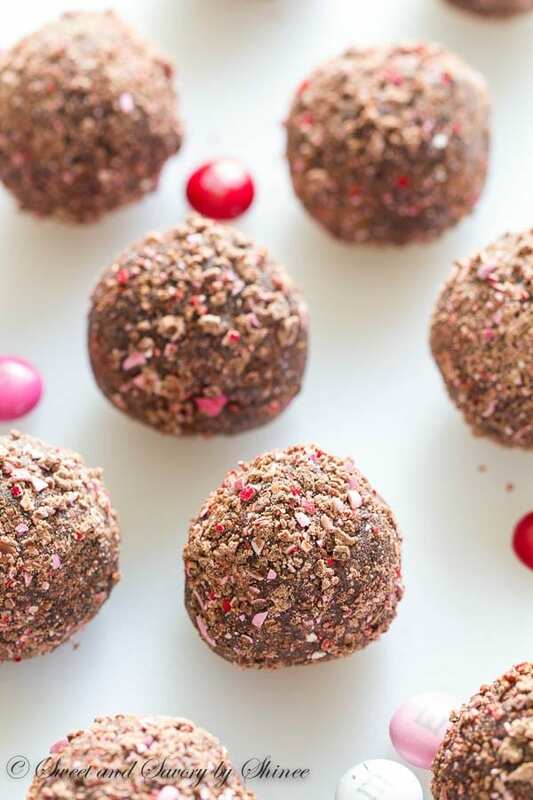 So to make these truffles, you heat heavy cream and pour it over the chocolate. Let it melt undisturbed for two minutes, then slowly mix with a spatula until smooth. 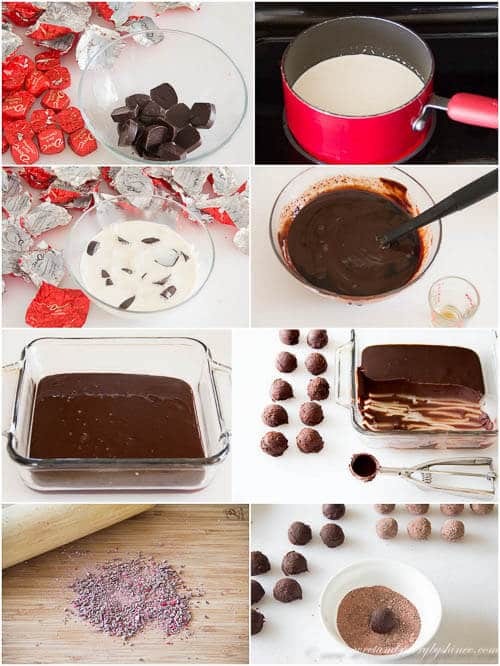 Add a splash of Kahlua to bring out even more chocolate flavor, pour the mixture into a shallow dish and chill for couple hours! Then form into balls and roll in the crushed M&M’s®. To crush the M&M’s® candies, simply use the rolling pin. I tried chopping with a knife and using a blender, but found they get either too chunky or too fine. You have the most control with a rolling pin. You see that smooth texture I’m talking about?? Pure heaven right there! Unwrap the chocolates and place in a medium bowl. In a small saucepan, heat heavy cream over medium heat just until boiling point. Pour it over the chocolate. Let it melt undisturbed for two minutes, and then slowly mix with a spatula until smooth. Stir in Kahlua. Pour the mixture into a shallow dish (I used 8x8in(20x20cm) baking pan) and chill for at least 2 hours in the fridge, until set. Crush the M&M’s with a rolling pin until desired fineness. I like it pretty fine with some colorful specks. 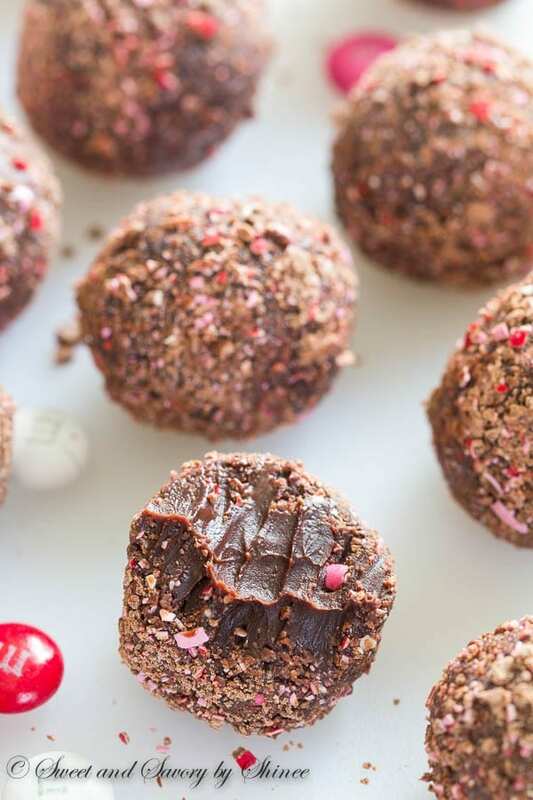 Using a medium cookie scoop, form the chocolate mixture into 1.5-inch (about 3.5cm) balls and roll in the crushed M&M’s. Keep refrigerated for up to 5 days. 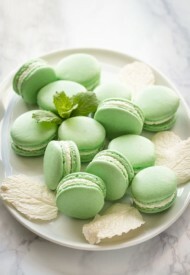 These look so cute and delicious! I can’t wait to try them! 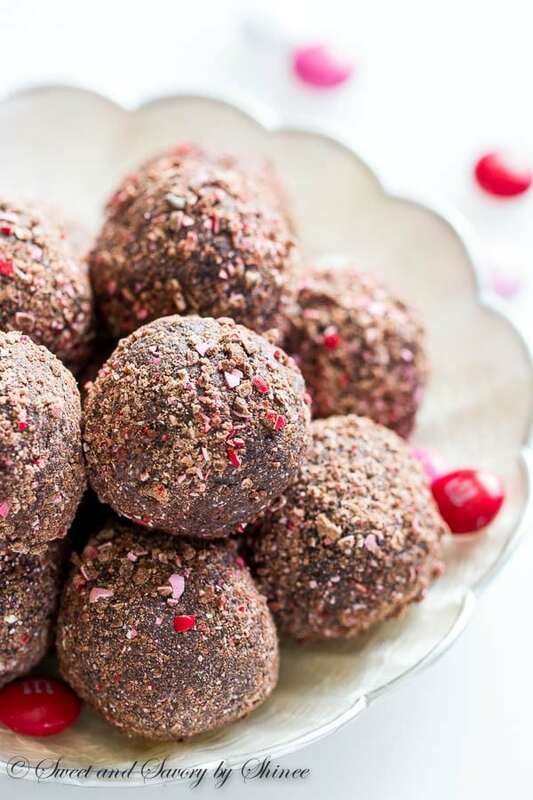 I bet that little bit of crunch from the coating is such a tasty addition to the truffles, yum! Yep, it definitely adds some crunch. So great. Thanks, Emily! Classic it is, Nagi! Thank you. Yeah, they’re the best, Jess. Hope you’ll make and enjoy them.